Whittling wooden clothes pegs as a young boy in Blyth, Northumberland, did not go down particularly well with his mother - but was a first step towards a lifetime of working with wood. Back in 1958, Ernie Warren joined Ralph Hedley (Craftsmen) Ltd in Newcastle-upon-Tyne as an apprentice - their very last, as it later turned out. His training took place in what was still an almost Victorian workplace, full of the smell of wood and of fish glue bubbling away on the stove. 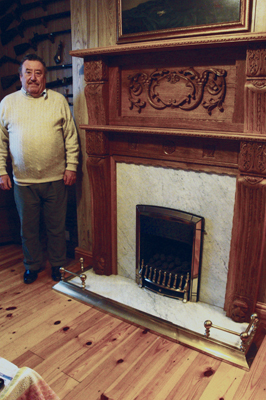 With this famous firm, and later on a freelance basis, Ernie went on to work as a woodcarver, cabinetmaker and antique furniture restorer across the North-East. 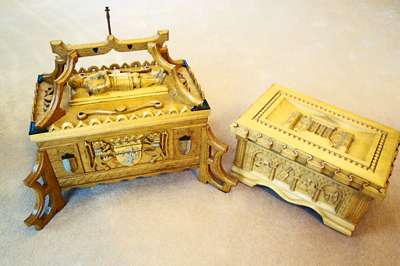 Box making was another talent that Ernie developed, using his cabinetmaking and carving skills together to produce boxes with elaborately carved decoration. Around 40 of these boxes were produced over the years, and many of them are now scattered across the globe. The letter-carving skills he learned as an apprentice came in especially useful, as was his ability to design secret drawers and compartments. Crafted from English oak (Quercus robur), this major piece of decorative work delivered on a commitment made to his wife, Sheila, and took three months for Ernie to complete single-handedly. Lions' heads at the base of the pillars associate with the Northumberland Percy family of Harry Hotspur fame. Other features include egg-and-dart motifs, Corinthian capitols, cornucopia - or the horn of plenty - the white rose of York, and harps; the latter in recognition of Ernie's wife's homeland, Ireland. After retiring, the opportunity to pass on his skills to others presented itself when Northumberland College invited him to establish an adult education course in woodcarving at its Kirkley Hall campus near Ponteland. It was there that I met the man who was to teach me and many others how to carve, and how to sharpen our tools! Ernie remains a stickler for sharp chisels and gouges. 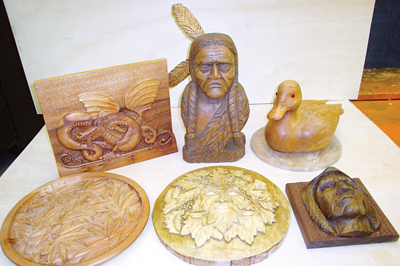 The course evolved into the now independent Kirkley Hall carving group. Around 16 of us meet there weekly in term time to carve, share ideas and benefit from Ernie's tutelage. We also benefit from an endless store of tales and anecdotes, all delivered in the kind of robust Geordie accent that often challenges those of us who are non-natives! Ernie still handles the occasional piece of commissioned work, but most of his pleasure from woodcarving these days comes from passing on his skills to others. He's done a sufficiently good job of this that he reckons some of his students' work even rivals his own. Praise indeed from a true professional.